One of the templates to get a revision in Visio 2010 is the Cross Functional Flowchart template because of the new list and containment functionality that has been added into the core application. I had to write a small bit of code in earlier versions of Visio for each flowchart shape to automatically understand which swimlane and phase it belongs to, but now there are ShapeSheet functions available, so a slight modification of a flowchart master enables it to inherit values from the swimlane that it is in. This article demonstrates who you can do this to, for example, synchronize the fill color of each flowchart shape to that of the swimlane that it belongs to. Each Swimlane shape is now a container shape, as is the CFF Container and Phase shapes. 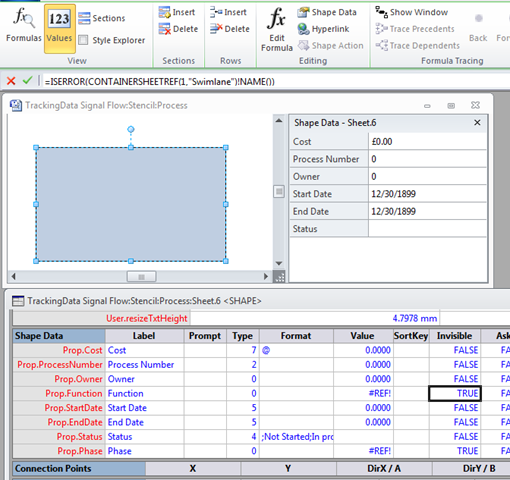 Notice that the Process shape has a Shape Data row, named Function, which automatically updates itself with the text entered into the header text of the Swimlane that it is within. 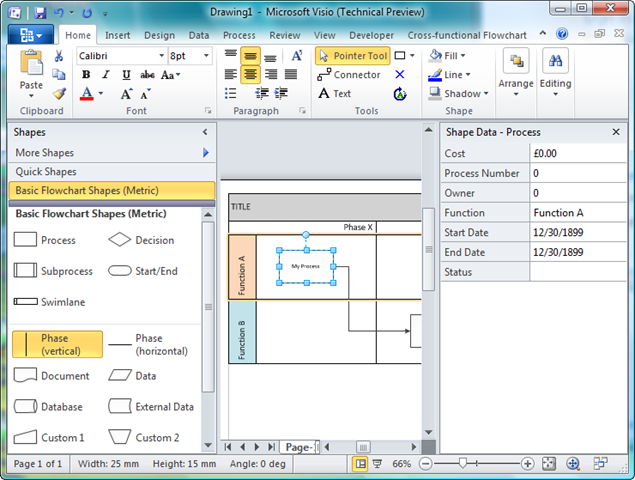 Unfortunately, it is not the same for the Phase that it is within … perhaps Microsoft will correct this for the official release of Visio 2010, but in the meantime I will propose a workaround later in this post. Additionally, the Function shape data row is displayed, regardless of whether it is within a Swimlane or not, therefore I will show how the visibility can be controlled to automatically hide if it is not within a Swimlane. The second value will be CFF Container, CFF List, Swimlane or Phase, depending on which Master it is. In the above example, the My Process shape is actually within three containers, a CFF Container, Swimlane and Phase (note that the new Phase shape actually extends from the Swimlane headers to the right hand line that has the Phase X label). Debug.Print , "ID", "CFF Container", "CFF List", "Swimlane", "Phase", "Name"
Notice the new shape method MemberOfContainers() which returns an array of container shape IDs, which are then used to get the actual container shapes in order to discover what type of container they are using the new HasCategory() method. The new ShapeSheet function, CONTAINERSHEET() requires the index position in the list of container shapes, and the second argument enables the list of returned containers to be filtered by the category. The Scratch.A1 cell formula is =User.visHeadingText, which has the formula =SHAPETEXT(Sheet.13!TheText) . There is also a new function, CONTAINERCOUNT(), which returns the number of containers that the shapes is within. Notice that I did not filter out the contained containers, but I did filter out the connectors (1D) shapes. Debug.Print "ID", "CFF Container", "CFF List", "Swimlane", "Phase", "Name"
Notice the new page method GetContainers() which returns an array of container shape IDs. These container shape IDs are then used to retrieve the actual shapes, and the new shape collection ContainerProperties has a method GetMemberShapes() which will retrieve the desired member shapes. There is also a new ShapeSheet function, =CONTAINERMEMBERCOUNT(), which returns the number of shapes contained within it. As stated earlier, the Swimlane master has a user-defined cell, visHeadingText, which contains a reference to the text of a sub-shape (Sheet.7 in the Master). However, the Phase master does not, therefore I added the visHeadingText user-defined cell to the Phase master in the local stencil, with the same formula, because the text edit target shape in that master is also Sheet.7. This means that you can then edit the flowchart masters, for example the Process master, to display the enclosing Phase shape in a new Shape Data row, in the same manner as the Function Shape Data row. Like before, these edits were done to the master on the local document stencil. A useful consequence of having the Phase in each shape is that these values will now be exposed to the Visio reporting tool. To avoid the needless display of Shape Data rows when they are not relevant, I decided to add formlae to the Function and Phase Shape Data rows. Finally, I get to set the fill format ell values so that the Process master is synchronized with the enclosing swimlane. The Fill Format section of the Process master has several modified formulae in order to synchronize the fill color wit the enclosing swimlane. Fortunately, I have already setup a cell which tells me if the shape is inside a swimlane or not, so it is a simple matter to refer to that value to evaluate whether to apply the fill properties of the enclosing swimlane, or just to use the default values from a theme. 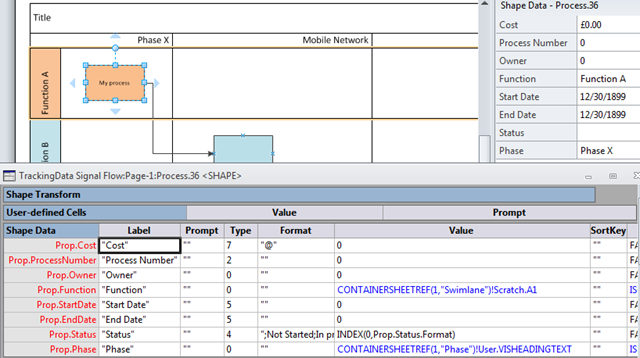 So, there we go, we can now enhance the Cross Functional Flowchart template with just ShapeSheet functions … the new containment features of Visio 2010 are really useful additions to the rich developer interface … enjoy! Hi, I’m looking for a way to extract info about container and childs from a VDX file…do you maybe know how I can do this? That’s fine because when I move the shape around the property will be set accordingly. 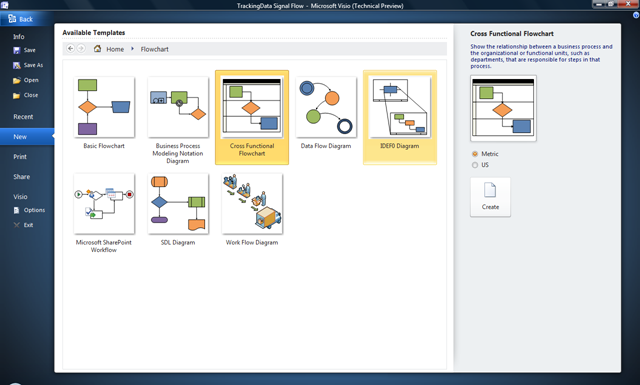 Am using Visio 2013 as BPMN tool (v2.0). Have 2 pools…1 of which has multiple lanes. This is what I can’t figure out: Some of the BPMN task dragged into the lane has the prop.Function attribute set to the lane’s Name. However, other tasks I drag into a lane, don’t even show the prop.Funtion attribute on the Shapesheet. When doing the same mechanics (as far as I know), what is causing some BPMN tasks to show this on the Shapesheet and others not? Thanks in advance for any…all help. 2. Going to the Edit>Undo list, the action of adding a new Lane was/is called “Insert into List”. Somehow, this “Insert into List” Visio function somehow fixed the assignment of Prop.Function to all new BPMN Task drag-drop’s. 3 Completing the Edit>Undo of the “Insert into List”, a drag-drop of the BPMN Task leaves me w/o the Prop.Function property and associated Lane assignment. 1. Somehow, my existing BPMN diagram seems somehow “out of sync” with normal/expected Visio behavior. How can I fix this short of recreating everything as its a very big, complex diagram. In other words, is there a way to force Visio to reconstruct, clean-up, fix the diagram? Note that the cell contents are not guarded, so they could be accidently overtyped in the UI (or in code). 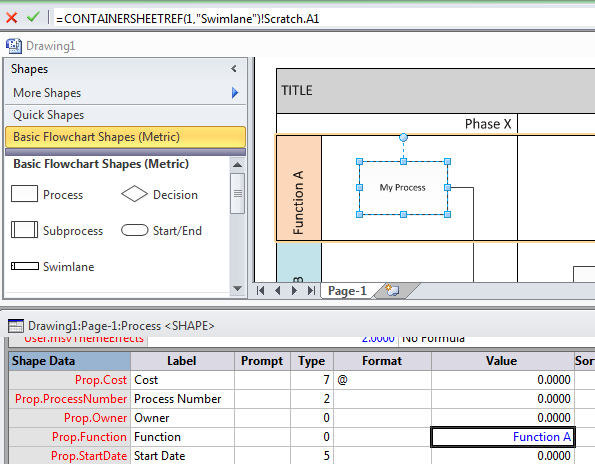 Looking at the BPMN masters, I personally think that it was an error of judgement by Microsoft not to include the Prop.Function Shape Data row by default, because letting the CFF addon create that row on the fly, whenever you drop a shape into a Lane, means that the whole Shape Data section becomes local, rather than inherited. Given the large number of rows in the Shape Data section of the BPMN masters, then it will have an effect on file size. You can amend the code in my other answer to you to add Prop.Function rows where needed. While I haven’t completed digested your feedback, I did want to take a quick minute to say “thanks”.